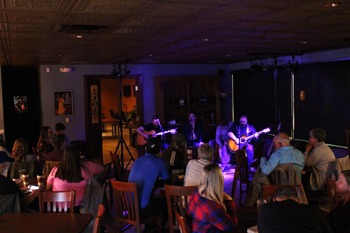 Java Johnny’s had the privilege of holding our first concert of 2018 on January 26, featuring local musicians ROOM FOR ZERO and Jillian Gavigan & Brandon Bihn. 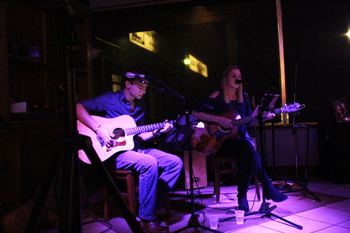 Jillian Gavigan & Brandon Bihn packed a powerful punch as Friday night’s openers. Playing a wide variety of acoustic covers from the Cranberries to Maroon 5, this local duo’s set was full of music for everyone to enjoy. Jillian & Brandon also played a new original song for the crowd, showcasing their wide range of talent. When closing with Sublime’s iconic “Santeria,” Jillian’s father joined them onstage to play lead guitar, which he often does when the band plays long sets of music. Java Johnny’s would like to thank both of these wonderful, talented bands for sharing their music with us on Friday and we hope to have them back very soon! ROOM FOR ZERO will be playing at Urban Artifact in Cincinnati on February 10. Follow them on Facebook to keep up with future shows. Jillian Gavigan & Brandon Bihn have an upcoming show February 3 at Trinity Gastro Pub in West Chester. To find out more information, follow them on Facebook.